One of my favourtie things about sewing is being able to recerate a garment, style or trend. I talked more in depth about this 'super power' here, and this top is another example of one that was inspired by a top of the highstreet and altered to make it just right forthe wearer. It was one of my lovely friend's birthday recently, and when I offered to make her a top she immediately took me up on the offer. It was the second time (after this jumper) that I made an item of clothing for another person who isn't in my family, something which is always quite nerve wracking! Making this top was definitely a challenge, but I thouroughly enjoyed it! The actual design of the top (other than the tie) is quite simple, but the difficulties came in other forms. We talked quite a lot about different styles and in the end my friend asked me to recreate this ready-to-wear top. It would have been a fairly straightforward copying had I had a physical copy of the top but I did not. We even went to our local Pull & Bear so that I could have a look at the construction of the top but (of course!) they didn't have any in stock. This left me with nothing other than the images on their website to recreate the top, which as you can imagine was not ideal. I would really love to properly learn how to use a dress form to design and draft patterns. 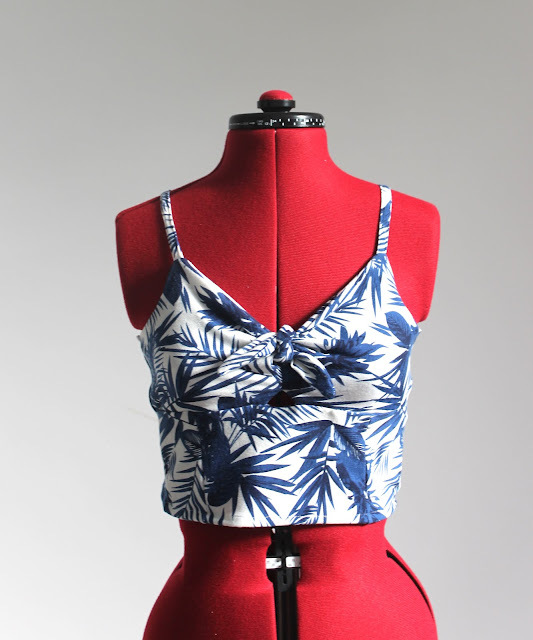 I created this top by draping the fabric over my mannequin, cutting, sewing and pinning spare bits of calico fabric to use as toiles and taking lots of measurements. And... it worked!! I was delighted with the finished top on the dress form but the moment of truth came when my friend tried it on; not only did it fit but she loved it and very kindly wore it at her party that weekend. The hardest part of drafting the top was probably the armhole, which I think has a fine line between being too high and too low. The knot looks fairly intricate but is actually nowhere near as difficult as it looks: it's just the bodice pieces coming to a long point on either side to form two pieces which can then be tied together. At my friend's request I kept the hole as shown in the orignial top, but sewed the two bodice pieces together partly to create a much smaller hole than it originally was. I'm so proud to have been able to recreate something without a pattern and that the reciever loves. 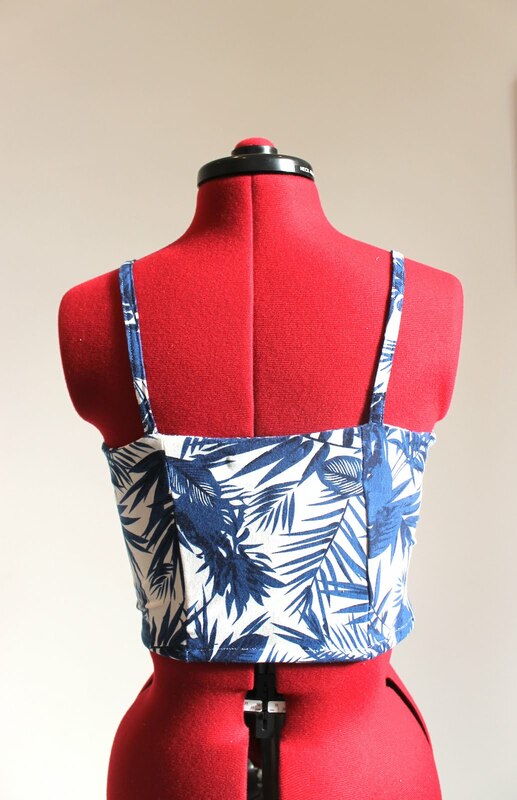 In fact, when my sister saw this top on the dress form she asked for a similar one out of the leaftover fabric, so I have another one to show you very soon! Wow. Recreating a garment from only a photo is a pretty big feat! Lucky friend, lucky sister! fabulous top. The freedom of being able to create without a pattern and you have such a lucky friend who is now able to wear it! The top looks great! How amazing that you were able to recreate it the way you did!